Optimal working dilutions should be determined experimentally by the investigator. Suggested starting dilutions are as follows: WB (1:500-1:2000), IHC-P (1:100-1:300), IP (2-5 ug/mg lysate), ELISA (1:20000). Not yet tested in other applications. Fig. 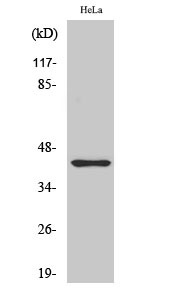 Western Blot analysis of HeLa RAW264.7 cells using Jun B Polyclonal Antibody. JunB is a basic region, leucine zipper (bZIP) transcription factor belonging to the Jun family that includes c-Jun and JunD. Jun family members homodimerize or heterodimerize with Fos and ATF proteins to form a functional transcription factor AP-1 (activator protein 1), whose activity is regulated by a variety of physiological and pathological stimuli such as growth factors, infections, and stress signals. While JunB sometimes antagonizes c-Jun transcriptional activity, it may functionally substitute for c-Jun during development in mice. JunB regulates hematopoietic stem cell number and plays an important role in the pathogenesis of chronic myelogenous leukemia (CML) and acute myeloid leukemia (AML). 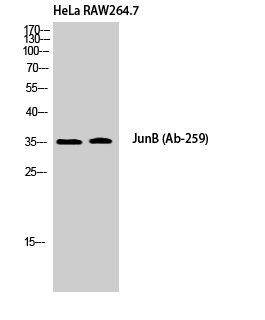 Jun B Polyclonal Antibody detects endogenous levels of Jun B protein.